Hello everybody, this is Sara Komarnisky, phD student from British Columbia, Canada. This summer I began fieldwork for my PhD dissertation in a town in the Mexican state of Michoacán, near the capital city of Morelia. My project explores the historical and ongoing connections between Alaska and Mexico and how and why those connections have been obscured or ignored. I hope to show you a little bit about how and where Alaska can be found in this town – and how I have gone about looking for and documenting the connections between the two places. In June and July, I lived in a two story house in rural Mexico with a family who lives most of the year in Anchorage, but visits their hometown in Mexico every year. This family (mother, father, and teenage children) has been living in Alaska for 15 years, but the father worked in Alaska for many years before that. The grandfather also worked in Alaska, he first went there in 1960 where he found work that paid better than in California. Over the years, he worked as a dishwasher, then in construction, and finally on the Alaska pipeline. I’m interested in tracing these kinds of family connections between Mexico and Alaska, because I think it shows what a long period of interconnectedness there is between these two places. It also demonstrates that migration and immigration from Mexico to Alaska is not really that “new”, even if it is increasing. When people move, they bring things and ideas with them. So, while I was in Mexico I documented the kinds of things that people bring with them from Alaska to Mexico, and from Mexico to Alaska. This follows up on earlier work I had done about food and migration, called “Eating Transnationally: Mexican Migrant Workers in Alaska.” In that thesis, I found that people travel from Mexico to Alaska with a lot of food – bread, mole, cheese, candy, and other things that travel well and are permitted across the border. This time, I noted the same thing but I also paid attention to the kinds of things people brought with them from Alaska. Souvenir items like hats, magnets, T-shirts, and posters are worn by people in Acuitzio or displayed in their homes. I didn’t think about souvenir items as things you might bring to decorate your own home, but the homes of Alaska residents in Mexico are decorated with images of mountains and moose – very stereotypical and touristy representations of Alaska. 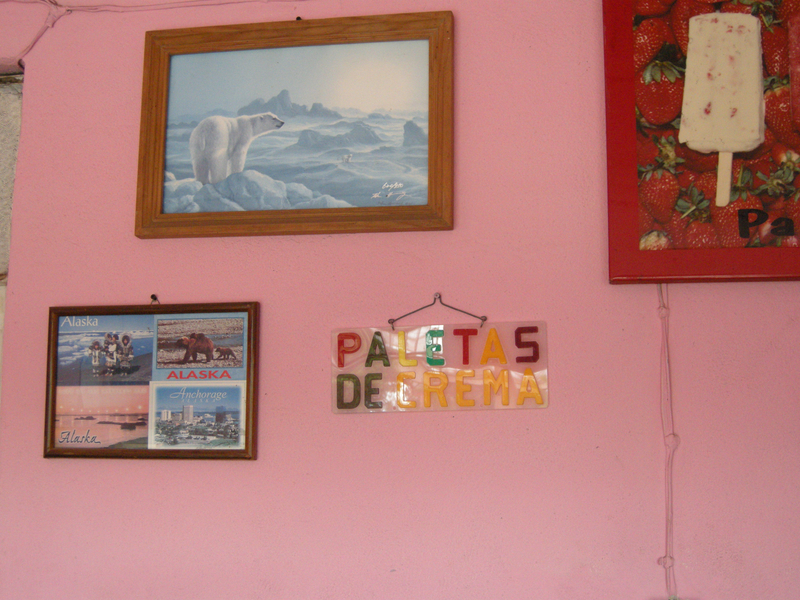 For example, an ice cream shop I visited was decorated with snowy images from Alaska (see photo above) – postcards and paintings sent by family members and displayed above the coolers filled with paletas (popsicles) and nieve (ice cream). The family I mentioned earlier had another reason to visit – their daughter turned 15 earlier in the year and they were celebrating her quinceanera in their hometown. I helped with the preparations for this event, and attended the party. The quinceanera was important for marking an important moment in this young woman’s life, but it was also an opportunity to bring together family and friends with food and drink, music and dancing. Many people plan fiestas in Acuitzio – baptisms, quinceañeras, weddings, and anniversaries when they are in town visiting. These kinds of events bring together Alaska and Mexico at different points in people’s lives, I think. I’m writing this from Anchorage, where I am beginning the second phase of my research. I’ll spend time with many of the same people here, but I’ll also work with community organizations and groups here to find out more about being Mexican in Alaska more generally. I feel like this project is an opportunity to look at “the North” from the perspective of “the South”, and to investigate topics like immigration and urban anthropology in a northern city. Stay tuned for another update! This entry was posted in All, Fieldwork, North American North. Bookmark the permalink.